It’s no secret that the Oregon Ducks have one of the most talented rosters in the PAC-12. However, the one position group that has given prognosticators pause is the wide receiving core. 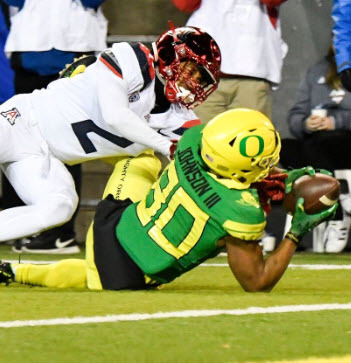 The passing game had its share of hiccups in 2017, and with a future NFL draft pick at quarterback, many blame the Ducks’ receivers for the offense’s inconsistency through the air. Those skeptics are in for a major surprise this season. 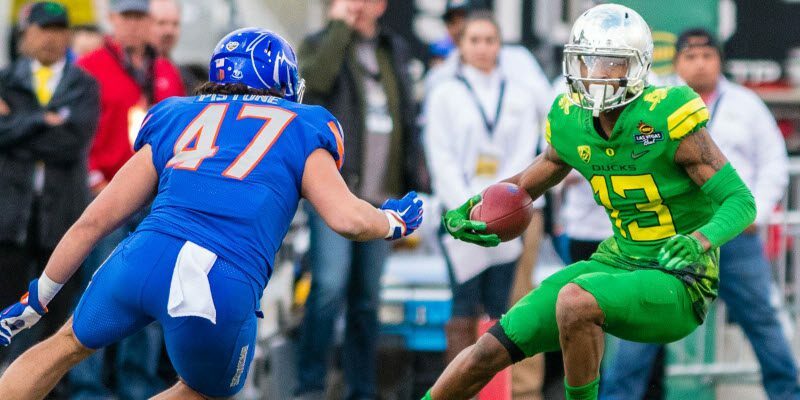 Although the Ducks’ receivers had their struggles last season, they are not short on talent. 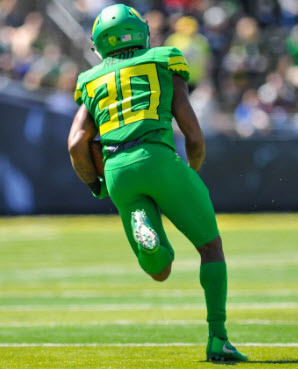 If they can combine their potential with the consistency that comes through experience, the erstwhile liability of the team may end up becoming the stars of the Oregon offense. What About the Lack of Production in 2017? At every position, experience and continuity are important, but they are particularly critical at the wide receiver position. Much of a receiver’s game is dependent upon the timing and rapport he develops with his quarterback. That takes practice, and experience in live competition — something the Ducks’ receivers lacked entering 2017. Johnny Johnson III performed well despite being a true freshman. At the start of last season, Brenden Schooler and Taj Griffin were both brand new to the position, Dillon Mitchell became a starter for the first time in his career, and Johnny Johnson III and Jaylon Redd were fresh out of high school. These “rookies” were thrown into the starting lineup from the outset, and they were expected by many to perform as if they were seasoned veterans. It was unrealistic to expect so much from the unit. 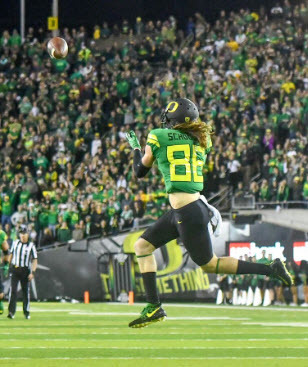 Now, with a season under their belts, and a full off-season with Justin Herbert established as the starting quarterback, we should get a better picture of what the receivers are capable of. The Ducks’ receivers have the talent, if not the consistency. Each player has demonstrated elite skills that can keep opposing defensive backs on their heels. Brenden Schooler races past defenders to catch a deep pass from Herbert. Schooler is a former track and field athlete with legitimate speed. He timed a wind-aided 10.76 in the 100m in his senior year of high school, a number that ranks among the fastest college football players. If he is able to learn the nuances of his position, he will become a dangerous vertical threat. Johnson showcased his mitten-like hands on numerous occasions, making multiple catches in traffic down the field. Who among us fans didn’t replay his acrobatic, diving snag against Nebraska about a hundred times? Redd and Griffin* both have the lateral agility and playmaking ability that get fans out of their seats and leave defenders gasping for air. Both finished in the top half of their position groups, with SPARQ ratings of 106 and 136, respectively — marks that put them among the top athletes in the nation. Newcomer Tabari Hines put up nearly 1,500 yards in his three seasons at Wake Forest, despite playing with an adequate-at-best quarterback. He proved he was capable of succeeding in a situation with marginal supporting talent, and now he has a Heisman candidate throwing him the ball and a roster full of high-level recruits complementing him. Finally, Mitchell reminded folks why he was a four-star recruit with his late season stretch of dominance. In his final two games, he totaled 15 catches, 262 yards and two touchdowns. If he can carry the momentum he gained at the end of 2017 into this season, he’ll have a breakout season. When looking at how the receivers fit into the new-look Oregon offense, each player’s strengths complement one another. They’re a versatile group that can attack defenses in a variety of ways. Jaylon Redd’s athleticism will be an asset in the screen game. The wide receiver screen game is a big part of the Mario Cristobal/Marcus Arroyo offense. When the opposing defense loads the box to stop the run, the Ducks love to chuck the ball on the edge and attack the perimeter. However, for the screen game to work, it is necessary to have dynamic playmakers who can win out in space and use athleticism and creativity to make defenders miss in the open field. Speedsters Redd and Griffin both fit the mold perfectly. Each of these players has the explosiveness and quick-twitch athleticism that can turn a short screen pass into a huge gain. Success in the screen game causes defenses to bring bodies closer to the line of scrimmage to disrupt the timing of the play. The Ducks will counter that by throwing deep shots to Schooler and Johnson. Among returning Oregon wide receivers with more than five catches, Johnson and Schooler finished first and second, respectively in yards per catch, which highlights their ability to stretch the field. Schooler has the speed to blow by defenders, while Johnson uses his superior ball skills and body control to win at the catch point. With those two on the roster, the Ducks can punish defenses for getting greedy. But what about the intermediate game? Isn’t that where the Ducks struggled so much last season? Dillon Mitchell snags a high pass in warmups. Both Hines and Mitchell are ideally suited to be possession receivers. They have shown that they are capable of winning the confidence of their respective quarterbacks, a crucial trait when running intermediate routes, as there is an element of trust that is necessary to complete the often-contested passes. Mitchell had ten more receptions than the next closest Oregon receiver in 2017, and Hines led the Demon Deacons with 93 catches over the past two seasons. It’s clear that both receivers were often the first players their quarterbacks looked to when they needed someone to make a play. Heading into 2018, Herbert will have two reliable options when throwing intermediate passes into tight windows. 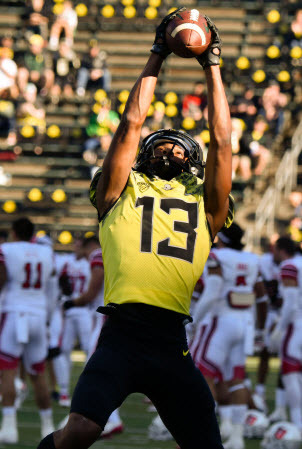 All in all, the Ducks’ wide receivers are a well-rounded group, capable of stressing opposing defenses at every level. They have elite talent, and the group as a whole has a good deal more experience than last year. With another year under much of the same offensive staff and continued offensive evolution from Arroyo, expect the wide receiving group to emerge as one of the best in the conference.